1300RUBBISH expands across Australia eliminating the arduous and time consuming task of removing rubbish and unwanted items from homes and businesses. 1300RUBBISH Pty Ltd, www.1300rubbish.com.au, is the first Australian company to provide a personal rubbish removal service to homes and businesses. 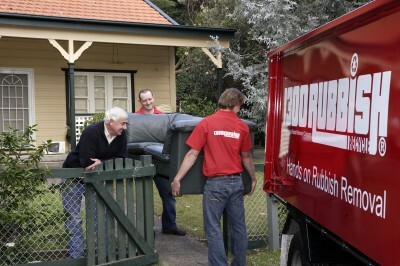 1300RUBBISH offer a superior and convenient rubbish removal service. They load all items and clean up before taking it away. Customers don’t lift a finger. The service eliminates the hassle of trips to the local tip, ordering skips which require council approval, take up space and often filled by neighbours and, importantly, lifting heavy items. Yet it is offered at a very competitive price. 1300RUBBISH is now present in Sydney, Melbourne, Gold Coast, Brisbane, Adelaide and Perth. With many opportunities in most states of Australia due to the high demand from customers. The type of rubbish 1300RUBBISH collect is very diverse and often isn’t even rubbish. It can range from furniture, washing machines, refrigerators, desks, boxes and garden waste. 1300RUBBISH clear out vacated offices; factories damaged by fire; retailers’ storerooms; building sites with left over material; houses being renovated; and homes which are full of rubbish. 1300RUBBISH are committed to recycling for a sustainable future. Drivers take the rubbish to transfer stations which recycle all reusable materials. 1300RUBBISH is the first company to create a strongly branded, polished and professional image in this industry. They have transformed the image of rubbish collection with their uniformed, personable staff and bright red trucks. The business was established the business in 1989 going door-to-door around Sydney’s lower North Shore offering to remove rubbish and has developed into a national rubbish removal business. The team developed a real understanding of the demands of the market place and recognised early the key factors important to clients.